Are you looking for ways to leverage a beverage company around an endurance-related event? Are you looking for new ways to integrate alcoholic beverage companies? Coors Light is capitalizing on the buzz around the 2009 ING New York City Marathon by partnering with the New York Road Runners to offer a creative "Race to Refreshment" promotion for NYC residents and visiters to enjoy. The promotion enables consumers who stop in ten (10) participating establishments across the NYC boroughs to receive a commemorative medal for finishing. 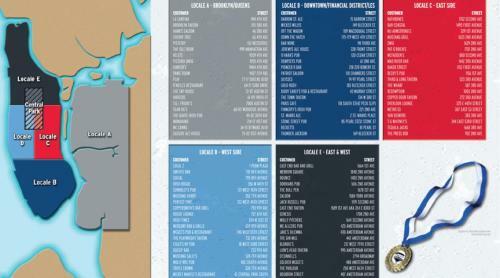 At each stop, participants must collect two (2) official Race to Refreshment stickers from each of the five (5) boroughs and securely place them on an official pamphlet. Once all ten (10) stickers have been received, consumers are asked to mail the form to a stated address and allow 12-14 weeks for the delivery of their exclusive medal. 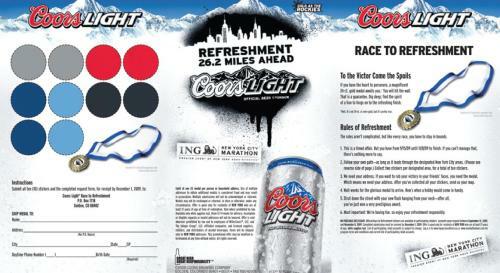 Coors Light distributors and participating locations will run the promotion from September 15th through November 8th. As the Official Beer Sponsor of the ING New York City Marathon, Coors Light will also offer "refreshment as cold as the Rockies" to race participants and fans at post-race parties across Manhattan and provide beer for official hospitality events leading up to the race on November 1st.